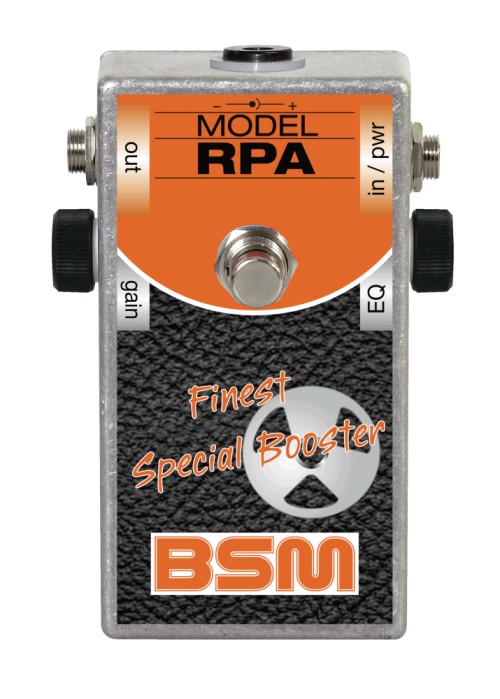 The BSM RPA Special Booster is a combination of Ritchie Blackmores AIWA reel-to-reel tape recorder preamp stage plus the high-pass treble booster function from Blackmores hot-rodded Marshal Major amp, to emulate Ritchies post '74 sound with any standard amp. In 1974, right before the start of the "Burn" tour, Ritchie Blackmore changed his live setup. First and foremost, he wanted to play live with an echo effect and made the AIWA TP-1011 reel-to-reel tape recorder his first choice. This unit offered the typical 2/3 seconds echo repeat, perfectly matching Blackmores natural beat. Additionally, Ritchie Blackmore used the integrated microphone pre-amp as a booster, and with this his beloved Hornby-Skewes treblebooster he used for many years was not longer needed and was sent into retirement. The necessary trebleboost function (from a technical point of view a "highpass" function), was built into his heavily modified Marshall Major 200 amp. The Major amp now received a cascaded pre-amp stage with a new, non-bridged cathode resistor at one of the triode stages to prevent to much overall gain. At the final stage, Blackmore's Major amp was loaded with four pre-amp tubes (incl. the driver tube), instead of the factory stock three tubes. Further on, the 250Ohm screen-grid resistors of the four KT88 power tubes were changed to 1kOhm and the two 10uF electrolytic filter capacitors of the BIAS power supply were replaced by two 47uF (160volt minimum) caps. Blackmores tech, did several fine tunings over the years to Ritchies Major amp, because Ritchie experimented with several pickups in his guitars as well as with several new ideas of his trademark sound. Not everybody owns such a heavily hot-rodded amp, and if so, for sure it will not have the correct highpass cutoff frequency! So BSM had the idea, to not only rebuild the AIWA preamp stage, but to also integrate the important highpass function with the original cutoff frequency. The BSM RPA (Ritchies Pre Amp) emulates both typical soundshaping functions in only one stompbox - another BSM first ! The RPA is equipped with a gain control, to dial in the best possible balance for the use with different amps and pickups. The EQ control allows a tonal fine tuning for the use of the RPA with different pickups, amps and speakers for an optimum in versatility. Depending on the pickups, the sweet spot of the EQ control is located between 11:00 and 01:00 o'clock. Another highlight of the RPA was more or less created by accident: with the gain pot fully opened, and the EQ control completely closed, you receive the authentical Blackmore sound from the great "Machine Head" album or Ritchie Blackmore's "Rainbow". As a soulmate for the RPA, you can use any mild sounding amp with a good master control function. Plug it in front of the CLEAN or CRUNCH channel, but don't use the high-gain or distortion channel ! Because of the EQ control, you can use all kinds of pickups, from the brilliant sounding low-gain Fender Custom Shop 69' (aka "Abigail Ybarra" pickups) up to the thundering Seymour Duncan "Quarterpounds". The RPA Special Booster is inserted between guitar and amplifier, not into the FX loop. The magical tone is achieved by the interaction between guitar pickup, booster and amplifier. The unit is powered by a 9V battery with a current consumption of approx. 350 uA. You can also power the unit, using the external "Boss style" (2.1mm - tip negative) DC jack, the internal battery will shut off automatically then. The average output level is 10dBm, the maximum output voltage when the strings are struck really hard is 6V max. Because of the external DC jack, you can power the RPA with 9, as well as with 18 volts for more headroom. And another one from Janeck Dzugan, his Strat is loaded with Lace Sensor "Hot Gold" pickups and a Lace Sensor "Silver" in the bridge position, besides this, he uses Blackmore´s techs MTC circuit. Here a new track from US Metal guitarist Joe Stump aka „The Shredlord“ from his new solo album. Joe have loaded his Strat with a “Spice Box” and the “Munich ´77” pickups from Leosounds in Germany and used as preamp/ booster the RPA unit. If you have any questions concerning our products, especially the BSM RPA Special Booster, our tech-head and mastermind Mr. Bernd C. Meiser would be happy to talk to you. So don't hestitate any longer and send him an email to info@treblebooster.net or use the contact form to contact him.